I have decided that watching every Elvis movie is a good idea. There are 31 movies in total. This project will likely drive me insane. Well. Here it goes. 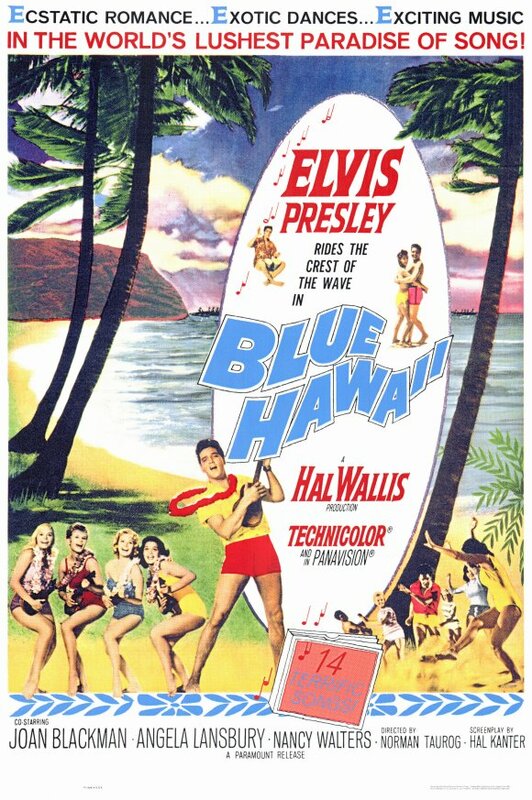 I finally found the energy to write about Blue Hawaii. First, I should quickly reintroduce this project. For no logical reason, I’m watching every Elvis movie in chronological order and blogging about these movies. That’s it. That’s the entire project. Oh, and occasionally I write about One Direction. So far I have found Elvis’s film career to be profoundly interesting. As I previously noted, his filmography can be divided into three stages: the pre-army films (1956-58), the most popular films (1960-66), and the final films (1967-69). 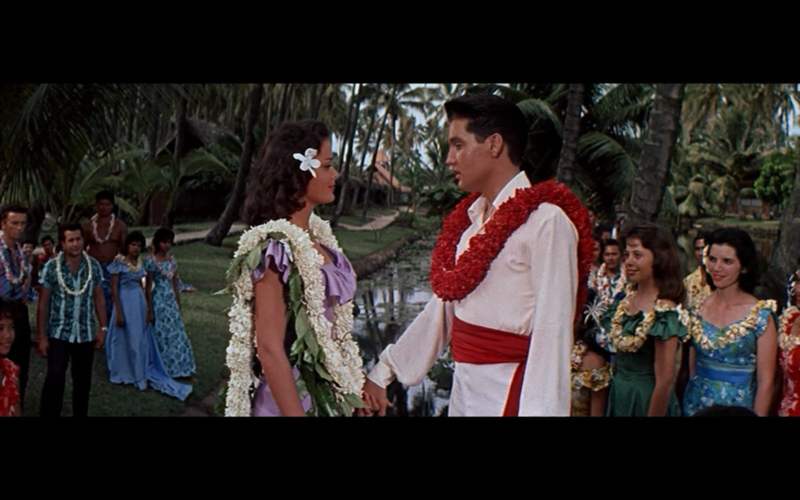 Presley’s film career before Blue Hawaii is arguably the most intriguing period of his career. Three of his early roles (Love Me Tender, Flaming Star, Wild in the Country) are dramatic parts and he only occasionally appears in musicals (Loving You; G.I. Blues). The more creatively daring musicals Jailhouse Rock and King Creole showcase a different side to Presley as a performer, before he got stuck appearing in repetitive musical farces. 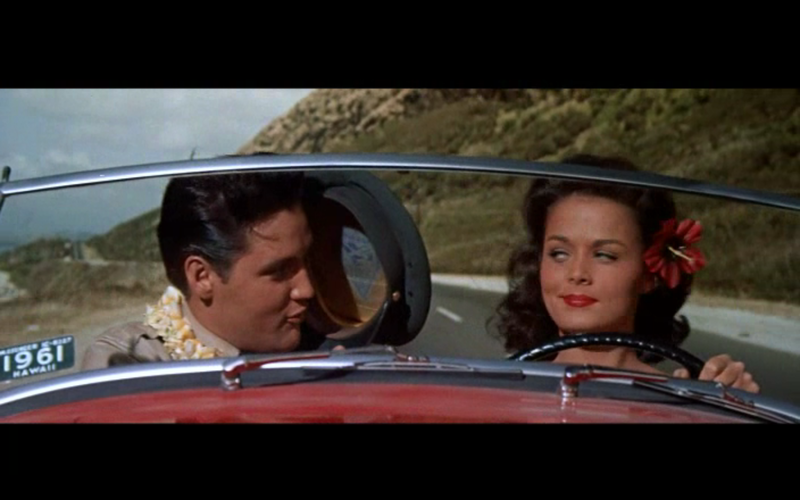 Set in Hawaii, Presley plays Chad Gates, a soldier who is returning home after his military service. (Elvis as a soldier? What a shocking character development.) Chad is eager to reunite with his girlfriend Miley (Joan Blackburn) and soak up the Hawaiian sun with his buddies. He absolutely does not want to start working for the Great Southern Hawaii Pineapple Company, the family business that is also a thinly veiled representation of American imperialism in Hawaii. Chad’s life of leisure, his girlfriend, and his friends (who his mother lovingly calls “that native girl” and “those beach boys”) constantly puts him at odds with his parents. Who can blame Chad for not wanting to work when this is his life? Having Chad work as a tour guide is essential to the film. It is a simple way for Blue Hawaii to endlessly showcase the gorgeous Hawaiian landscape that the average movie goer might not have been exposed to in 1961. (Keep in mind that Hawaii had only achieved statehood in August 1959, exactly two years before Blue Hawaii was released in November 1961. Furthermore, beach films were only just becoming a frequently produced genre.) 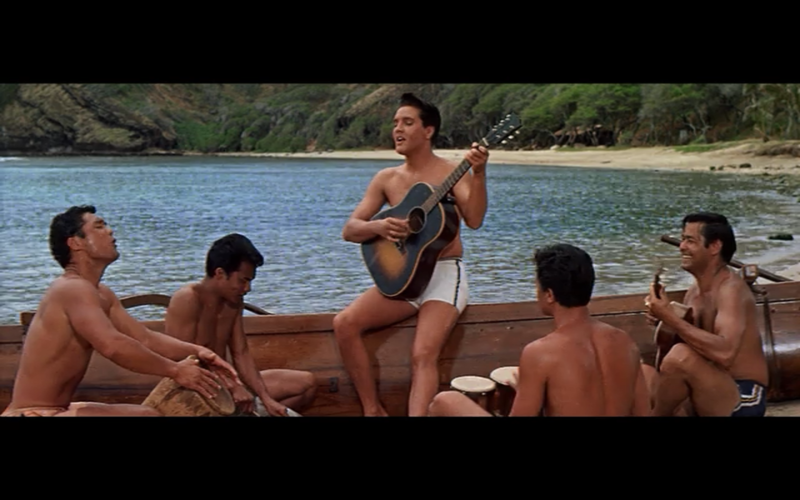 With this performance, whether he is acting or singing, Elvis Presley is the audience’s personal tour guide and he is tacitly promoting an idea that Hawaii is every American’s paradise now. Songs like “Hawaiian Sunset”, “Island of Love”, “Aloha Oe”, and especially “Moonlight Swim”, which Chad sings as he drives a tour group to a pineapple field, all reflect this. Blue Hawaii also tirelessly works to introduce Hawaiian culture to non-Hawaiian audiences. It does so through the presence of non-threatening ethnic others who appear in secondary and tertiary roles as police officers, gardeners, and field hands. These characters are safely sequestered in the background. The most visible “safe ethnic others” are Chad’s friends and frequent bandmates. They are introduced to the audience while rowing traditional Hawaiian boats and singing “Aloha Oe”. Because they immediately launch into a performance of “No More” with Chad, we trust these characters. And if our Hawaiian tour guide comfortable with these ethnic others, then we can be too. Because of the presence of the secondary ethnic others, the impact of US imperialism in Hawaii becomes omnipresent. 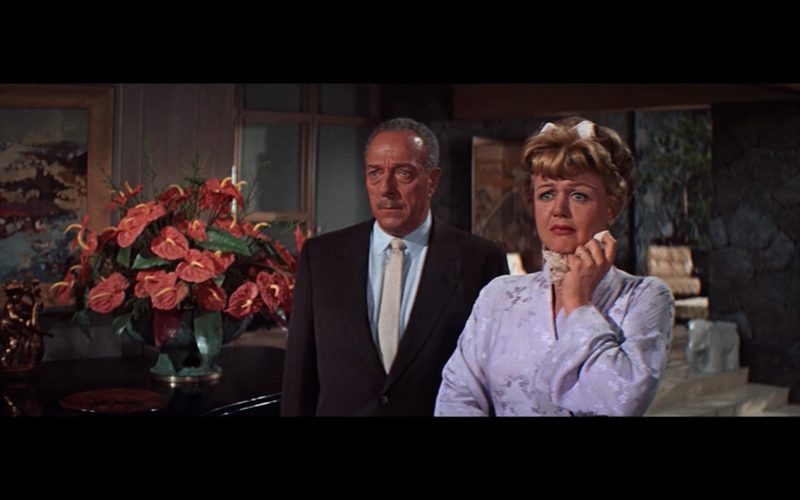 Hawaii’s white settlers are represented by characters like Sarah Lee Gates, Chad’s mother, who is played by Angela Lansbury. Although Sarah Lee depends on the servant Ping Pong to manage her household and freshen her mai tais, she looks down upon the native Hawaiians, calls them names, and judges their lifestyle. A character like Sarah Lee shows how the native Hawaiians are seen as unequal to the white settlers and tourists. Furthermore, characters like Ping Pong is also used for comedic relief. This is also true of Chad’s friends as seen during the musical number “Ito Eats,” an impressively absurd representation of the ethnic other. To join Chad and Miley in holy matrimony, a conflict is needed. Enter the tour group from hell. Someone thought it was sensible to put Chad in charge of four impressionable teenage girls and a spinster teacher. (No Elvis movie is complete without a spinster.) Chad goes above and beyond to show the group a perfect tour of Hawaii. Unfortunately on his tour group is miserable Ellie, a 17-year-old brat who is the only person unable to appreciate that she is in Hawaii and that Elvis Presley is her tour guide. She doesn’t care. Miserable Ellie is determined to ruin this vacation for everyone. She sulks and makes rude comments. She considers herself to be an enlightened young woman but in reality she is a horrendous teenager. Chad: You know what you need? A good old fashioned spanking. Ellie: Maybe I do. Nobody ever cared enough about me. Even for that. Chad: Alright Eleanor. If that will prove that somebody does care. Chad: Wouldn’t I dare? Wouldn’t I? I’ve got a feeling this is going to make both of us feel an awful lot better. Thus Chad spanks miserable Ellie and it looks like this. This is the officially the most confounding scene in any Elvis movie thus far. No wonder the eroticization of the male body is one of the least interesting aspects of this movie. So, yes. In order to show miserable Ellie that someone cares and to make themselves both feel a lot better. Because that makes sense and there is nothing remotely sexual or twisted about this scene. Nothing at all. And, behold! The spanking works! The very next day Ellie is a pleasant, well-liked creature. Then Miley and Chad make up, decide to start their own travel agency, and get married the very next day. Much to shock and dismay of Mrs. Gates. So at the end of Blue Hawaii, an insufferable teenager gets spanked into submission and Hawaiian tourism thrives. White American and native Hawaiian cultures are happily merged. And the union of a heterosexual, interracial couple ensures the future success of the United States, imperialism, pineapples, surfing, and shirtless men playing ukuleles. It’s a freaking United Color of Benetton ad. As if I needed another reason to love Angela Lansbury, she makes a number of beautiful facial expressions throughout Blue Hawaii. Let’s appreciate some of them together. Stumbled across while watching a soon-to-be-expiring Blue Hawaii on Netflix looking for a Blue Hawaii compendium. I enjoyed the review and support you and the ambitiousness of the Elvis Project. I will definitely be checking back for perspective on The King and other more contemporary feature films. Thank you. U people need to learn to count. There are “32” Elvis movies. And i should know, I own all of them, all 32. Thank you. What an enlightening comment. Congratulations on owning 32 Elvis movies. U people are very lucky.